Why did Facebook never fully roll out the original redesign of News Feed it introduced last March, opting instead for the simpler version it began rolling out earlier this month? According to Director of Product Design Julie Zhuo, the quality of users’ screens had much to do with the design shift. Developer, designer, and blogger Dustin Curtis wrote a blog post last week, lamenting the loss of the March 2013 version of News Feed (pictured above), and claiming that the social network found that users with that version spent less time on Facebook, specifically areas such as event pages and friends’ profiles, impacting ad revenue. 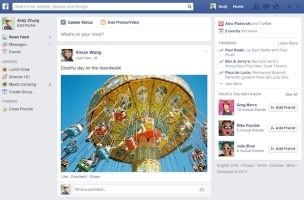 Curtis’ post was titled, “Whatever goes up, that’s what we do,” quoting a Facebook employee he overheard in a coffee shop in San Francisco, and Zhuo penned a rebuttal post, “Whatever’s Best For The People, That’s What We Do,” in which she mentioned the difficulties of viewing the March 2013 News Feed on low-resolution, smaller screens, and netbooks, and claims that this was the motivation behind the March 2014 redesign (pictured below), and not time spent on the social network or ad revenue. A year ago, Facebook announced a new News Feed that was completely redesigned to focus on content — it had large photos, big user icons, better integration with Facebook Messenger, and it brought Facebook’s website into closer alignment with its mobile applications. It was beautiful. During the few months I was able to use the new design, my Facebook experience was significantly better. This is truly a nightmare scenario for any CEO: Do you take the risk and proceed with the better user experience/product at the expense of short-term numbers — with no promise that the better design will actually lead to long-term benefits — or do you scrap the new design and start over? The answer to this question is where company culture and identity dramatically peek through the curtain and express themselves in very raw form. Because it is impossible to answer this question rationally — both sides can be argued very successfully — it has to be answered from a cultural point of view. Based on the News Feed design Facebook eventually shipped, which is being rolled out right now, it’s obvious which answer Facebook chose. We’re blind. It doesn’t matter what any individual person thinks about something new. Everything must be tested. It’s feature echo-location: We throw out an idea, and when the data comes back, we look at the numbers. Whatever goes up, that’s what we do. We are slaves to the numbers. We don’t operate around innovation. We only optimize. We do what goes up. The goal of making News Feed all about the content — with bigger photos and more expressive stories — is near and dear to my heart. It’s why we started the project in the first place. But every design has its day of reckoning. And that reckoning is with the people you design for. If the change you’re introducing is better for them — if it helps them do the things they want to do more easily, if it’s more loved — then your design has succeeded. If it does not achieve these things, then it’s time to roll up your sleeves, learn which of your assumptions were wrong, and get to fixing. It turns out, while I (and maybe you, as well) have sharp, stunning, super-high-resolution 27-inch monitors, many more people in the world do not. Low-res, small screens are more common across the world than hi-res Apple or Dell monitors. And the old design we tested didn’t work very well on a 10-inch netbook. A single story might not even fit on the viewport. Not to mention, many people who access the website every day only use Facebook through their PC — no mobile phones or tablets. Scrolling by clicking or dragging the browser scrollbar is still commonly done because not everyone has trackpads or scroll wheels. If more scrolling is required because every story is taller, or navigation requires greater mouse movement because it’s further away, then the site becomes harder to use. These people may not be early adopters or use the same hardware we do, but the quality of their experience matters just as much. At the heart of developing any product is the question of what defines better? Dustin suggests that it shouldn’t be about short-term revenue and metrics. I couldn’t agree more. The old design we tested last year would actually have been positive for revenue. But that’s not a reason to ship a worse design. The old design was worse for many of the things we value and try to improve. Like how much people share and converse with their friends. Or how easy it is to navigate to your groups. Or how efficiently you can get the information that’s important to you. On top of all that, most of the people we showed the design to told us they didn’t like it more than what they previously had. This isn’t about short-term metrics versus long-term value. (The dangers of that I’ve articulated here). This is about designing something that works for the hundreds of millions of people who use the Facebook website every day, from all over the world, on all types of computers. The new design we’re currently rolling out to everyone delivers richer and larger photos, videos, and statuses. It cleans up a lot of clutter. People like it more than the design we tested a year ago. All of this, without making Facebook harder to use. As a designer, that’s something I’m proud to stand behind. 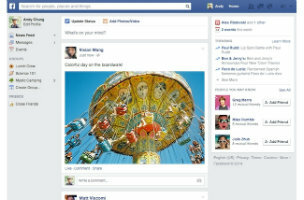 Readers: Which News Feed design do you prefer?